The new Mercedes-Benz B-Class creates an emotional link between vehicle, driver and passengers, says Tonio Darmanin. Under intense pressure from the SUV competition, the MPV segment is struggling to retain its fair share of the market. First introduced in 2005, the Mercedes-Benz B-Class has since sold 1.5 million units and the third generation of this sport compact tourer is designed to continue to buck the trend. The designers’ brief was to make the new B-Class stand out visually from the world of minivans. That brief was accepted and executed, with the long wheelbase with short overhangs, slightly lowered roof line and larger, 16- to 19-inch wheels contributing towards more dynamic proportions. The relatively squat, progressive front-end with flowing transition from bonnet to A‑pillar and on to the windscreen, along with the muscular shoulder of the body, underlines the sporty overall look. At the back, the width of the vehicle is accentuated by two-part lamps, reflectors integrated in the bumper and a distinctive black bumper bottom section with diffuser look and chrome trim strip. The large roof spoiler, along with high-gloss black spoilers at the sides of the rear window, makes for improved aerodynamics while ensuring a sporty appearance. The improved seat geometry and lower belt line make for an even more generous feeling of space than in the previous model. The driver sits 90mm higher than in an A-Class, thus enjoying an especially good all-round view. The interior of the B-Class is as avant-garde as the much-praised revolutionary interior architecture of the new A-Class, yet distinctive – while the instrument panel of the sister model is split into two horizontal basic bodies, that of the B-Class has a single basic volume, which drops away towards the occupants and has cut-outs in the area of the driver and front passenger. The cut-out in front of the driver houses the fully free-standing display unit, which comes in three different versions: with two seven-inch displays, with one seven- and one 10.25-inch display and, in the Widescreen version, with two 10.25-inch displays. A head-up display is optionally available. The five round air vents feature a high-grade turbine look with finely styled air ducts, inspired by the world of aviation. In the Style equipment line, the vent surround is colour-accentuated in the depth of the vent geometry to give the impression of an afterburner. The centre console with touch-based control and input system comes with a black panel look similar to the E-Class. The ambience lighting with 64 colours and 10 colour worlds, unique in this segment, allows individual adjustments, even to suit the mood. The seats offer a flatter and, therefore, more comfortable seating position as well as a larger adjustment range, which also increases the maximum headroom. The interior has been fine-tuned in many places: the improved passage over the centre tunnel in the rear makes for a more accessible middle seat. The rear seat backrest comes as standard with a 40:20:40 split. Depending on version it will be possible to slide the rear seats forward by 14cm and to move the backrest into a more upright position to vary the capacity of the luggage compartment behind the rear seats between 455 and 705 litres. With the rear seat folded down and luggage loaded to the roof, the luggage compartment, which is flat thanks to the adjustable load compartment floor, can accommodate up to 1,540 litres behind the front seats. 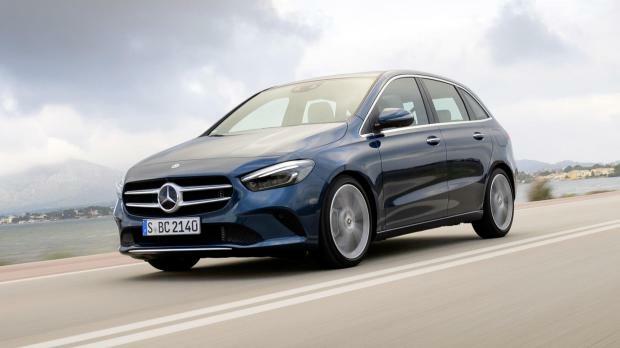 The new B-Class is the second car model after the A-Class to feature the MBUX (Mercedes-Benz User Experience) multimedia system, which ushered in a new era with Mercedes me connectivity. Its ability to learn thanks to artificial intelligence makes the system unique. MBUX is customisable and adapts to the user. It thus creates an emotional link between vehicle, driver and passengers. Its other strengths include touch-screen control as standard as well as, depending on equipment, a high-resolution Widescreen cockpit, navigation display with augmented reality technology plus intelligent voice control with natural speech recognition, which is activated by saying “Hey Mercedes”. The touch-screen is part of the integrated MBUX touch control concept – a trio consisting of touch screen, touchpad on the centre console (optional) and touch controls on the steering wheel. The new B-Class comes with driving assistance systems with cooperative driver support, thus providing one of the highest levels of active safety in this segment with functions from the S‑Class. There are a number of different engine options on offer, both diesel and petrol, and the 180D tested, equipped with a 1461cc, four-cylinder diesel unit developing 116bhp and matched with a 7G-tronic automatic gearbox seems to offer an ideal balance of efficiency and power. At the rear, the models with the entry-level engine variants come with a compound crank rear axle in the basic configuration. In combination with the more powerful engine variants or if the customer opts for one of the optional suspension systems. The new Mercedes-Benz B-Class puts the emphasis on sport with the sports tourer. It looks more dynamic than its predecessor and is more agile on the road while offering greater comfort.